The monthly meeting was held at the lake on July 12th at 1845 with Vice-Commodore Doug Roberts presiding in the absence of Commodore Reimer. The meeting started with a salute to past Commodores present. 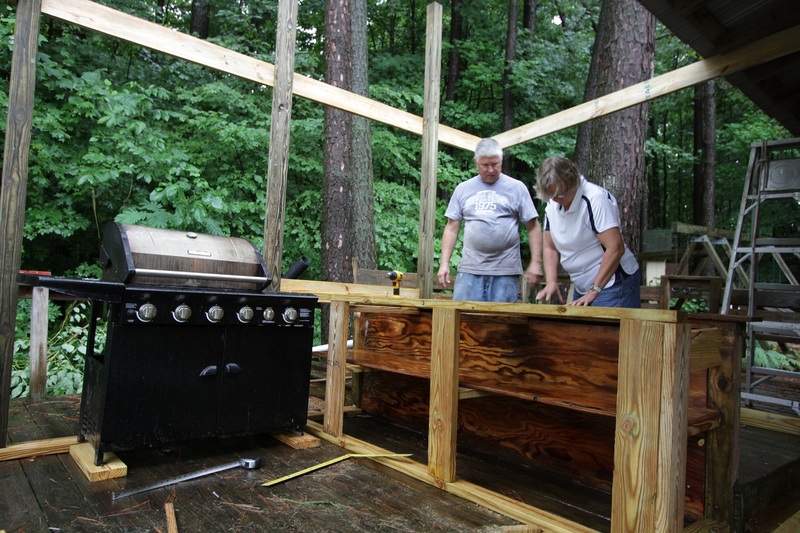 The rain over the Independence Day weekend that proved to be a wash for racing provided a soggy opportunity to begin construction of our new outdoor cooking area. The plan which was conceived earlier in the year, was discussed, debated and nearly completed in about three days. DIY specialists Doug Roberts and Deborah Champion design the work surface of the new cooking area on the fly! Purser Cannon gave the Treasurer’s report – The bills are paid. Cannon says that several of our members have not paid dues for at least one year. Delinquent notices will be sent shortly. Members not currently in good standing may see their boats moved to the upper lot to accommodate new members’ boats. Please pay your dues if you are in arrears. We have a new member this month, Emil Dular, from the Elizabethtown area. Welcome aboard Emil! Harbormaster Miller reports that due to the recent heavy rainfall the lake level is up well over summer pool, and the number of boats that are being left on the docks are increasing the windage and leverage placed on the submerged anchors. Please be mindful of this situation. Race Chair Rob Wyatt has rescheduled the Yankee Doodle for Saturday, July 27th and The Infinity for Saturday, August 3rd due to inclement weather on the original dates. The party that was originally planned after the Infinity will now be held on Saturday, August 17th following the Karl Millen Regatta. Another two part Sailing School session is also planned for August 10th and 17th and participants will be encouraged to take part in the regatta and festivities afterward. Social Chair Rob Hatcher was noted as resigning his position. Commodore Reimer will pick up the slack in the meantime and is actively seeking a replacement. Scribe Gary Guss started a new career in real estate earlier this year, and as such has seen very little spare time. Hence, he has passed the pen to Rob Hatcher. Cooks are still needed for meetings for the remainder of the season. Contact Doug Roberts if you would like to volunteer for one of the meetings. There being no further business, the meeting was adjourned at 1905 and attendees were treated to some excellent shish-kabob grilled over an open fire by Peter Kafer. Thank you Peter! This entry was posted in Club News and tagged minutes by Port Oliver Yacht Club. Bookmark the permalink.